Is inflation beyond the government's control? A majority of respondents has voted in favour of the proposition, reflecting the widespread exasperation with persistently high allround inflation. Though no longer in the double digits seen last year, headline inflation has stayed in the high single-digit range this year despite a volley of interest rate hikes by the RBI. The basis for such a view can be two-fold. 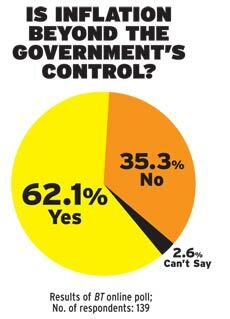 One, people believe the government has done everything it could to contain inflation. Even the Prime Minister admitted as much recently. Two, they have come to realise that high inflation is here to stay and there is no point in blaming anyone for it.